You are here: Home » Learn & Live the Faith » Catechesis » Preach It! The Bible is not just for Churches and Synagogues. Portions of it are read as literature, even in secular university classrooms. Invariably, when you look at the syllabus of such courses, you find Job. It’s not hard to see why. Job poignantly expresses what all human beings experience at one time or another–the feeling that life is a burden, that our daily routine is drudgery, that our suffering is meaningless, that there’s not much hope for our future (Job 7:1-7). Things are tough all over–in Job’s day, in ours, in Peter’s. It’s all about trying to earn a living and raise a family with taxes, government, disease, and unexpected tragedies yapping at our heels. The Gospel (Mark 1:29-39) shows us such a world that is suddenly turned upside down by someone who breaks all the rules. Demons that normally inspire terror themselves run away in fear. Fevers flee. Incurable illnesses yield. Instead of talk about the burden of the law with its innumerable regulations, Good News is announced that gives people hope again. The Good News is that God is on the move, that he, not the Emperor or the Prince of Darkness, is King, and he is not slave-master but Father. The someone responsible for all this commotion happens to look like one of them, and indeed is one of them, but does things that only God can do. As He speaks, they begin to feel as is the world may have meaning, that life may actually be worth living. They want to be with him, to hear his electric words and see his astonishing deeds. So they won’t leave him alone. Crowds gather outside the door of the humble place where he is staying. What happens next is instructive. Knowing his need for communion with his Heavenly Father, he rises early next morning to seek solitude and a few moments in prayer. But they need him. So they send the apostles to track him down. When they find him, he is not annoyed. He does not protest that it is his day off, tell them to come back tomorrow or sometime next week. He has come to bring Good News, to bring light to those in darkness, healing to the suffering. Many are desperate, so his mission is urgent. He gets up, but doesn’t return to Capernaum. Instead, he moves on to other towns. Those who wish to enjoy the excitement of his company must join him in his mission. St. Paul has the same sense of urgency as his master (I Cor 9:16-19). He is aware of being entrusted with an awesome responsibility. It is not an option for him to share the gospel. What he has received as a gift, the most precious gift imaginable, he must give as a gift. And he must give it not only to those he likes, or those with whom he has some natural bond. He must not do it only when it suits him, when it is convenient. No, he must exert himself. He must seek common ground with all, Jew, Greek, weak, strong, educated, uneducated–so as to express the gospel to them in a way that they can understand. And this mission led him to cover more ground than even his master–not just Judea and Galilee, but what is now Turkey, Greece, and Italy. Not all are called to be traveling preachers like our Lord and St. Paul. But the Church teaches unequivocally that membership in the one, holy, Catholic and apostolic church is not just about being saved and enjoying God’s company. There is a suffering world out there that desperately needs the saving truth and healing touch of Christ. 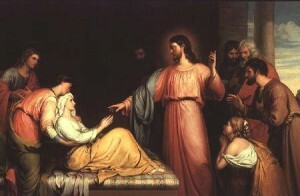 Notice that immediately upon being healed, Peter’s mother-in-law began working. Baptism is completed by confirmation, an anointing to serve. You can’t be fully a member of the apostolic church without participating in the apostolic mission.